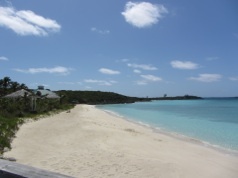 In the morning, we moved the short distance south to Highbourne Cay where Cathie and Tom (Interlude) had spent the night at the marina. 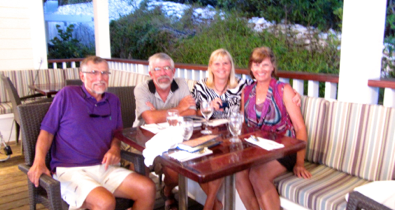 We had decided to come here to have a nice meal at the marina’s restaurant before they head back to Nassau and the States and we continue on to Eleuthera. 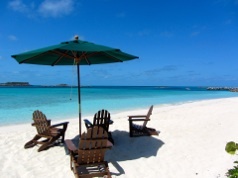 They would be going west and we would be going east from Highbourne Cay. As we came into the anchorage, two nurse sharks approached us and stayed next to us on the sea floor until Interlude came out of the marina about fifteen minutes later. 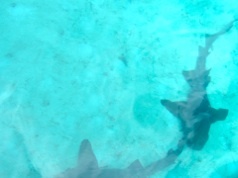 Then the nurse sharks went over to their boat for a visit. Often we have been greeted by dolphins as we enter an anchorage. We also have had the pleasure of being led through an inlet many times by dolphins. However, sharks as greeters was a new experience. 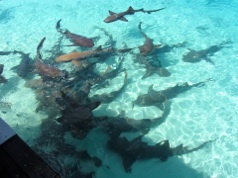 Nurse sharks are very common in this part of the Exumas, especially under marina docks near fish cleaning stations. The photo at the right is a group of nurse sharks at the Highbourne Cay Marina’s dock as someone throws fish parts to them. They lie on each other and don’t really grab at the food, sort of taking turns eating the scraps. The marina has a lovely beach with tables, umbrellas and other covered areas to sit and enjoy the view. These are only for cruisers staying in the marina, but anyone can go to their restaurant and bar, as well as their marina store. The store prices are much more than one pays in the regular stores here, but I did find frozen lemonade concentrate for only 15 cents more a can than I paid for frozen limeade in Long Island so I bought four cans. Yes, they were expensive at $4 a can, but a price I was willing to pay for something I was craving. Mark investigated the nearby coral reefs at Highbourne Cay in the dinghy and came back to tell me we were going snorkeling. The current was strong, so we had to hang on to a long floating rope tied to our dinghy which was anchored next to the coral. There were three large dive boats in the anchorage, so we knew there was good snorkeling here. We had reservations for dinner, but went to the marina restaurant a little early for drinks. I decided to splurge and have a frozen strawberry daiquiri. I figured it would be grossly expensive, however it was just $10, the same price the others paid for their gin and tonics and just a few dollars more than a Kalik beer. We also assumed dinner would be expensive but we didn’t care as this was a goodbye dinner. We have been traveling with Interlude off and on since we arrived together in Bimini on January 3. Amazingly the least expensive entree was lobster. It was good, but the company was better and a fitting ending to our boat buddy experiences this season. 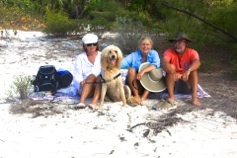 Mark took the picture below of Tom, Cathie, Daisy and me on one of the beaches at Cambridge Cay. We have so many good memories of our times together swimming, hiking, sailing, walking on beaches, going out to eat, sharing meals and sundowners on our boats and playing a variety of games. After dinner we went back to Seas the Day for dessert (key lime pie) and our last game of Mexican Train. As we approached the anchorage we saw that large swells were causing the boats to rock from side to side. Usually our catamaran does not feel swells this much. We tried to play the domino game, but at times they fell over and eventually we gave up. Even though our last night together ended in an early evening, we had a great time. It’s amazing how in such a short period of time, cruisers can become very good friends. The first few weeks we were on Seas the Day in 2008 we met Philip and Alison on Pascana and Gavin and Alice on Salty Dawg. To this day we still regularly correspond with them. I know that we will be long time friends with Cathie and Tom as well.